Jewelry, home decor, and cereal bowls will be showcased down the runway and up for sale at Merchandising Inc.’s first upcoming Sample Sale Fashion show Oct. 16 at the Library Mall. Merchandising Inc. members are bringing something different for this year’s Sample Sale by including a fashion show where students from UNT will be modeling accessories from the organization’s board of governors members such as Pier 1 Imports, Zales, and Fossil jewelry, said Professor Jennifer Ishmael, coordinator of the Sample Sale. Also, clothing will be donated to the fashion show from Sheplers’ Western Wear, Ishmael said. Merchandising Inc. fashion show producer Kaitlin Fairless said the event isn’t a formal, pay-for-ticket type of show; it’s a casual show where everyone can come see and walk around. A sneak peek of the clothing that might be showcased at the Sample Sale Fashion Show. 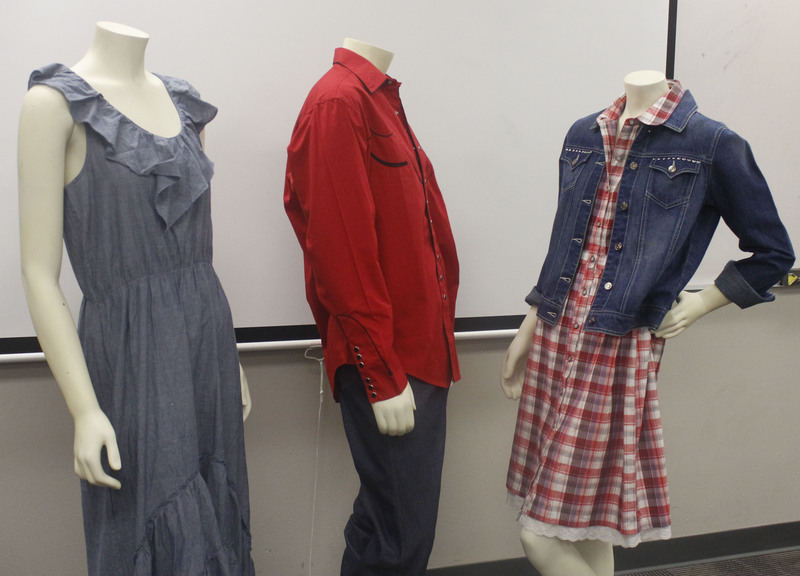 The main idea of the fashion show is to display the merchandise as well as getting students to show interest in the merchandise to promote sales at the event, said Ashley Nudge, another Merchandising Inc. fashion show producer. The Sample Sale is a way to raise money for scholarships for Merchandising and Digital Retailing students to travel and attend big merchandising events such as the National Retail Federation’s Big Show, said Ishmael. The money raised from merchandise sold from the Sample Sale will go to travel expenses for the Merchandising and Digital Retailing students. The event is sponsor-less, and the 123 members of the organization will be playing a huge role in styling the models, makeup, and backstage help, Fairless said. In order to prepare for the show, the group has been in close contact with the brand managers who shows them merchandise and they pick what better suits the show, Nudge said. The first Sample Sale fashion show will feature many surprises that the viewers wouldn’t expect, Fairless said. Professor Ishmael said models may even be showcasing Tony the Tiger pajama pants and cereal bowls. Ashley Nudge, Merchandising Inc. fashion show producer, showing some of the accessories that will be used in the Sample Sale. “The whole concept is kind of risky because some of the merchandise is home decor stuff, so the models are going to be walking down with home decor items. It’s just a very kind of unique thing to do,” Nudge said. The first Sample Sale fashion show will be held from 10 a.m. to 2 p.m on Oct. 16 at the Library Mall behind the Hurley Administration building. No ticket is required to attended the event. All purchases at the Sample Sale are cash only.